Bangkok (VNA) – Vietnamese Buddhist followers in Thailand held the Vu Lan (Ullambana) festival to pray for prosperity and to commemorate fallen heroes at Canh Phuoc (Wat Samananamborihan) pagoda in Bangkok on August 27. The event was organised by the Vietnamese Language Knowledge Centre, the Vietnamese Thai people association in Bangkok, the Thai-Vietnamese business association in Bangkok, the Thai-Vietnamese culture association and Vietnamese Buddhist followers in Thailand. Participants pinned roses on their shirts to extend gratitude to their parents then joined a requiem ceremony to pray for Vietnamese soldiers who died for national freedom and independence. 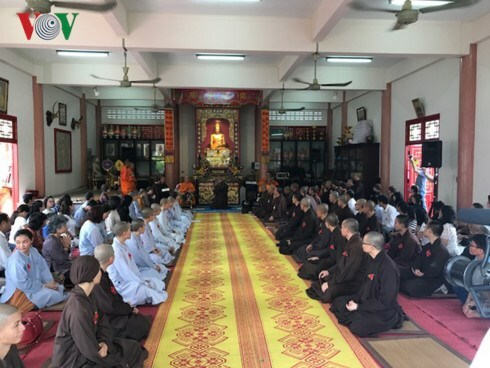 Most Venerable Thich Nguyen Chon, head monk at Canh Phuoc pagoda, underlined the significance of the event, saying that besides being a spiritual festival, the event also popularises Vietnamese Buddhism and connects Vietnamese expatriates. The event has been held annually among the Vietnamese community in Thailand since 2009. The festival falls on the fifteenth day of the seventh month in the lunar calendar, with this month known as the spirit month in Buddhism. On this month’s full moon, wandering souls are believed to return to their former homes.